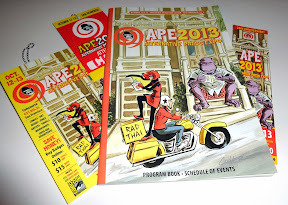 APE 2013 took place this weekend at the Concourse Exhibition Center in San Francisco, CA. This is the last year that APE will be at the Concourse. The Concourse has been home to APE for 10 years. Next year APE will move back to the Fort Mason Center on October 4-5, 2014. This year is APE's 20th Anniversary! This year there was over 400 exhibitors in attendance such as Super7, Baby Tattoo Books, SLG etc... APE specializes in Indie Comic Publishers, Indie Artists, DIY Creators etc... which makes them all the focus where they would usually get lost or looked over at bigger shows such as SDCC. Here's some of the stuff we picked up! Picked up a cool Halloween themed Simpsons print/poster from Chris Weiermiller who is a local artist/illustrator from SF, CA. Also picked up a cool Mewwwwwni T-Shirt from Ben Seto. 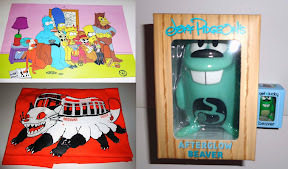 Also picked up a few Beavers from Jeff Pidgeon. The last pickup was a very cool resin Finger Crab by The Chung! aka David Chung. 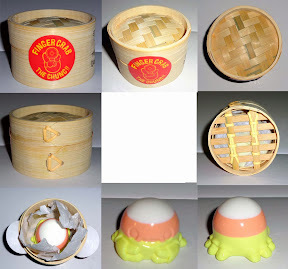 Really love the packaging which is a minature Bamboo type steamer. This version is limited to 10 pieces and was an APE Exclusive. 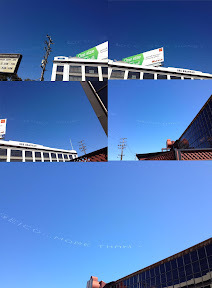 As we exited APE, Geico hired some planes to post some advertising in the sky over the area around the Concourse. We had a great time as usual checking out all the artwork, comics, toys etc... Farewell Concourse Exhibition Center! See you next year at the Fort Mason Center!